Back in April, I was introduced to several bloggers who work with Expressions Vinyl at the Snap! Conference. I’ve always been intrigued by vinyl, but I also found it intimidating. This post contains affiliate links. This post is sponsored by Expressions Vinyl but all opinions and thoughts are my own. Additional materials for this project were generously provided by Cricut and Wool and the Gang. After chatting with many vinyl-loving ladies at Snap!, I discovered that vinyl could do even more than I thought it could, and I was determined to get my hands on some for experimentation purposes. The ladies from Expressions Vinyl stepped in and shared a Blogger’s Pack with samples of 7 different types of vinyl. The Glitter Heat Transfer Vinyl in Jade (at the top) called out to me immediately, but the perfect project didn’t come to mind right away. With the holidays around the corner, I’ve had gift card holders on my mind for the past few weeks. I realized the Jade was perfect for personalizing a gift card holder for the holiday season, and this crochet pattern and tutorial were born! The heat transfer vinyl pairs perfectly with the Wool and the Gang Billie Jean upcycled denim yarn, but if you decide to make a yarn substitution, be sure to choose a 100% cotton or 100% denim yarn for safety reasons. If you’re new to vinyl, as I was, I’ve included detailed steps to make your first project a success. If you make your own Personalized Denim Gift Card Holders, I’d love to see them! Share your progress and questions by tagging me on Facebook as @Underground Crafter, Instragram as @ucrafter, or Twitter as @ucrafter. Sign up for my weekly newsletter and get a coupon code for your choice of one of my premium patterns and other subscriber goodies. Plus, you’ll never miss one of my free patterns again! Add the Personalized Denim Gift Card Holders to your Ravelry favorites or queue. These unisex gift card holders add a personalized, handmade touch to an otherwise impersonal gift. These are also a great way to use up small remnants of yarn and buttons from your stash! Standard (Large) Gift Card Holder. Standard: Approximately 4” (10 cm) wide x 3” (7.5 cm) assembled and folded. Large: Approximately 4” (10 cm) wide x 5.5” (14 cm) assembled and folded. Wool and the Gang Billie Jean (60% upcycled denim/40% upcycled raw cotton, 3.5 oz/100 g/148 yd/135 m) – 1 skein in Dirty Denim, or approximately 100 yd (91.5 m) in any medium weight 100% cotton or 100% denim yarn. 2 – 0.75” (2 cm) sew through buttons. Cricut Explore Air and Cricut Design Space (or other electronic cutting machine with design software), or pencil, scissors, and letter stencil. Expressions Vinyl Glitter Heat Transfer Vinyl – 1 sheet in Jade, or approximately 9” (23 cm) x 3” (8 cm) piece of any glitter heat transfer vinyl. Clover Mini Iron, or standard sized iron. Ironing board or other iron-safe surface. 16 sts in pattern = 4” (10 cm). Exact gauge is not critical for this pattern. Gift card holders are crocheted flat in rows and then seamed. Heat transfer vinyl is applied to back of gift card holder. To finish, attach buttons. Ch 18 (or any multiple of 3 sts + 3. If adjusting chain, be sure that it is wider than gift card to start). Row 2: Turn, ch 1 (counts as sc), (hdc, dc) in same st, *sk 2 sts, (sc, hdc, dc) in next st; rep from * across to last 3 sts, sk 2 sts, sc in t-ch. Rep Row 2 until gift card holder measures approximately 3”/5” (7.5 cm/13 cm) from start. Row 3: Turn, ch 1, working in back loop only across this row, sc in same st and each st across. Rep Row 2 until gift card holder measures approximately 3”/5” (7.5 cm/13 cm) from ridge formed by unworked front loops on Row 3. Row 4: Turn, ch 1, working in front or back loop only (so that ridge of unworked stitches will be on same side as Row 3 ridge), sc in same st and each st across. Row 5-6: Rep Row 2 twice. Row 7: Turn, ch 1, sc in same st and next 6 sts, ch 3, sk 2 sts, sc in next 7 sts. Row 8: Turn, ch 1, sc in same st and next 6 sts, 3 sc in ch-3 sp, sc in next 7 sts. Fasten off. Cut a piece of yarn measuring approximately 12” (30.5 cm). Thread yarn needle with thread. Fold gift card holder at Row 3 so that unworked front loops face the outside of holder. Repeat seam on other side. With yarn needle, weave in ends. Use the “mirror image” function to flip the letters for heat transfer vinyl. Program your machine to cut vinyl. Place the heat transfer vinyl on your cutting mat with the shiny side down and the clear, carrier sheet side up. Once the letters are cut, use the weeder to gently remove the excess vinyl and expose your letters. Continue on to instructions for applying vinyl. Use stencil and pencil to outline letters on clear, carrier side of vinyl. Cut letters out with scissors. Place gift card holders with front side down on ironing board or covered surface. Position vinyl letter on back side of gift card holder with clear, carrier side of vinyl facing up and vinyl facing gift card holder. Using mini iron, press down on carrier side of vinyl until you can see vinyl begin to remove from carrier sheet. Gently remove carrier sheet. If vinyl letter isn’t properly affixed, cover gift card holder with Teflon pressing sheet to apply more heat. With front side of gift card holder facing you, position button so that it fits through buttonhole with flap closed. With yarn needle and yarn, sew button to gift card holder. Insert gift card inside of the holder. © 2016 by Marie Segares (Underground Crafter). This pattern is for personal use only. You may use the pattern to make unlimited items for yourself, for charity, or to give as gifts. You may sell items you personally make by hand from this pattern. Do not violate Marie’s copyright by distributing this pattern, the photos, or the tutorial in any form, including but not limited to scanning, photocopying, emailing, or posting on a website or internet discussion group. If you want to share the pattern, point your friends to this link: http://undergroundcrafter.com/blog/2016/12/10/personalized-denim-gift-card-holders-with-vinyl-tutorial. Thanks for supporting indie designers! Back in April, I went to the Snap! Conference for creative bloggers and I had my first in-person experiences with electronic cutting machines. I had been peripherally aware of the existence of die cutting machines for years, but it wasn’t until Snap! that I discovered these machines had jumped into the electronic era and that they could cut a broad range of materials (that is, not just paper). This post contains affiliate links. This post is sponsored by Cricut but all opinions and thoughts are my own. After I came home, the whole electronic cutting thing was like a jingle I couldn’t get out of my head. I stared at machines while at Michaels, I started following new blogs, I had project ideas floating around in my mind, and I even squirreled away a few dollars for a machine. But then some other things came up and I had to put that idea on hold. A few months later, I heard about HGTV Magazine’s Blogger Block Party, and I was asked to write a post about it in exchange for products from some of the event sponsors. I saw that Cricut was on the list of sponsors and I crossed my fingers. On the hottest day of the summer, a giant box arrived, and my electronic cutting machine dreams came true. The folks at Cricut were quite generous. In addition to a Cricut Explore Air, there was another entire box filled with accessories. Once the box showed up, I’ll admit I got a little nervous. After all, I had never actually used an electronic cutting machine on my own. At Snap!, all the booths with electronic or die cutting activities had someone there to walk me through the steps. But once I actually opened the box, I wasn’t intimidated anymore. As soon as you open the box lid, you’ll find the Start Here folder. And, the folks at Cricut understand what it’s like to live in a house with two black cats because the Cricut Explore Air is wrapped up in a storage bag inside of the box. Hmmm, what’s inside the bag? Although the machine is wrapped up very securely, the packaging isn’t the type that you have to struggle against. Everything is easy to open (and just as easy to pack up again, if you’d like to store your machine in the box when it’s not in use). The machine itself looks like a very wide inkjet printer from the outside. Once I opened the Start Here folder, I found supplies and very clear instructions for my first project. Although you can, of course, make another project to start, I liked that this project walked me through the writing and cutting that the machine can do. I decided to use Cricut Design Space on my laptop, but there’s also an iPad option. Within minutes of opening the machine, I was done with my very first solo electronic cutting machine project. I was worried that I would tear up the cardstock while removing the small circles that were cut, but everything came off smoothly when I followed the instructions. As someone who actually had a rotary dial phone during my lifetime, I loved this nostalgic card. MC and I spent a few minutes ooh-ing and aah-ing over the precision, and then we were on to the next project! Now that I’ve told you my Cricut story, let me share my review of the Explore Air. It’s easy to use straight out of the box and there are tons of designs to choose using Cricut Access, so even if you aren’t confident with designing yet, you can make a lot of great projects as a newbie. I also loved that the support hotline number is printed clearly on the Start Here materials and if you stop a job mid-cut, Cricut Design Space will ask if you need help and the hotline number will pop up. I honestly can’t think of the last time I bought an electronic device that encouraged me to use the phone if I had questions. Although the sticker price of the machine is $299.99, it’s often on sale for less and you don’t have to buy dies like you would with the older machines. In other words, you’re paying up front for a lot of projects. The Design Space software is free to use online and you can choose whether to save your projects publicly or privately. There are free fonts you can use to write or cut and there are daily free images, and of course, you can design your own project, pay for images and projects on an individual basis, or subscribe to Cricut Access for $9.99/month (month-to-month) or $7.99/month (for an annual membership). I’m really excited about using my Explore Air to make customized holiday cards and gift wrap this year, but there are so many more uses for it! Because it’s so simple to use, it also makes a great gift. 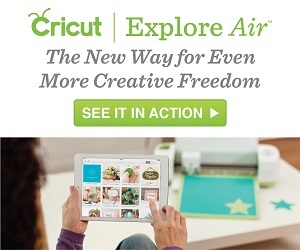 You can buy the Explore Air from Cricut, Jo-Ann, Amazon, and Michaels. Since I’m new to the world of Cricut, if you’re an existing user, tell me about your favorite projects to make!